Global Warming 101 – Part 3 of 5 | Fresh Air. The Scent of Pine. In this section, our third on the fundamentals of global warming and climate change, we’ll focus on the continual and global balancing act the Earth performs between climatic influences and global reactions. In previous sections, we noted that the Earth’s vital greenhouse effect is driven over long terms by less than 1% of the planet’s incredibly thin atmosphere. In discussing the Earth’s greenhouse gases, we noted that carbon dioxide is both long-lived and widely dispersed in the atmosphere, enabling it to drive long-term changes in global climate. We discussed the unprecedented nature of the human species in Earth’s history and how, in our brief existence, human actions have altered the face of the planet and often been accompanied by very severe and unintended consequences. Now, human industrial activities have driven carbon dioxide to its highest levels in 650,000 years, raising its concentration likely faster than at any time in Earth’s long history. But what impact does this have? The global climate constantly seeks a balance between the influences on it and its associated reactions. These influences are called “forcings”. 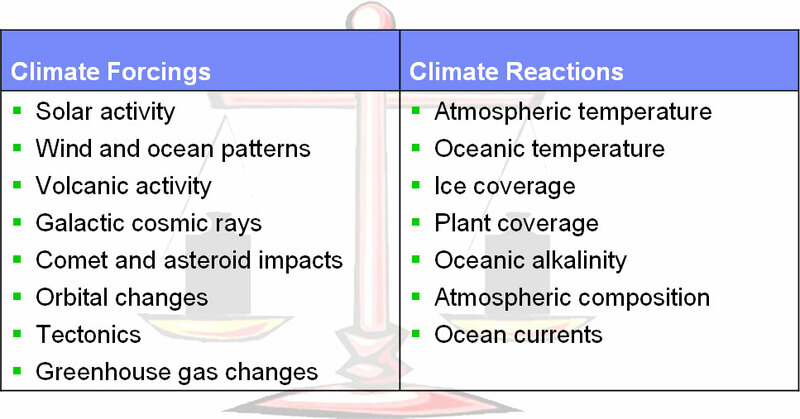 As detailed in Figure 3-1, there are many different influences, or forcings, on climate, including changes in solar activity, cycles in wind and ocean patterns, volcanic eruptions, variances in galactic cosmic rays, impacts from comets and asteroids, changes in the planet’s orbit, shifts in tectonic plates, and changes in atmospheric greenhouse gas concentrations. In response, the Earth changes aspects of its biosphere including atmospheric and oceanic temperatures, ice and plant coverage, oceanic alkalinity and salinity, the composition of the atmosphere, and the functioning of ocean currents. The Earth’s climate does not seek out a set of “ideal” conditions, just an equilibrium between both sides of the scale. However, similar to the differences between greenhouse gases discussed in previous sections, not all forcings have equivalent impacts. Different forcings place different amounts of “weight” on the system, and systemic balance can be achieved with either a small or a large amount of weight on each side, say with either very cold or very hot conditions, as illustrated in Figure 3-2. Forcings, or weights, are also not added to the scale all at once. They can be added very quickly or very slowly. And the longer it takes to add a weight to the system, the longer the effects have to adapt, keeping the entire system closer to equilibrium. The combined magnitude, speed, and frequency of the forcings on the system at any given time dictates how balanced or unbalanced the system is and under what predominant climate conditions a balance can be found. When forcings are cyclical, the weight associated with them is alternately added to the scale and then removed from it as the cycle progresses. Considering this combination of characteristics, it is easy to see that a smaller weight added quickly, like a volcanic eruption, can disturb the climatic balance more dramatically than a larger weight added slowly. To illustrate this, consider the example given in Figure 3-3. Start with a balanced scale with 5,000 pounds on each side. On the 1st day, you add 1 pound to the forcings side of the scale. It is miniscule in comparison to the existing weights on the system, and the system remains in balance. However, the added weight remains. On the 2nd day, you add an additional 2 pounds to the forcings side, still a negligible amount. 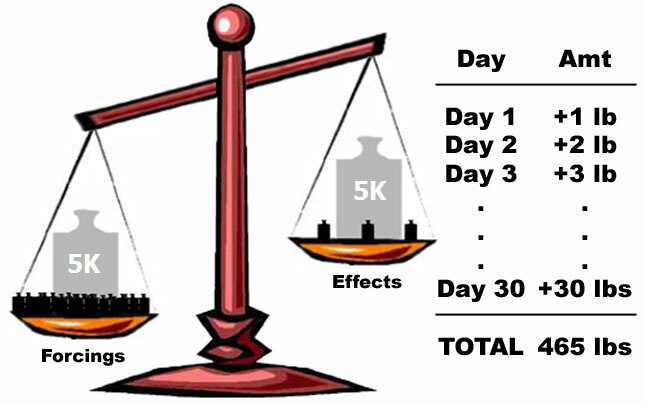 On the 3rd day, you add 3 pounds, and the weight accumulates. You continue this progression for 30 days, quickly adding very small amounts of weight, until, on the 30th day, you add 30 pounds to the forcings side of the scale. Meanwhile, the opposing side of the scale, the effects side, is changing and attempting to compensate to restore the balance, but at a much slower rate. Throughout this process the largest amount of weight you’ve added at any one time is only 30 pounds, a mere 0.6% of the 5,000 with which you started. However, in total, you’ve added close to 500 pounds, and, what was once a balanced system is now considerably unbalanced. And this is what has been happening in the Earth’s climate system. Each successive year, industrial activities add increasingly larger amounts of weight on the system through carbon emissions. As these emissions accumulate in the atmosphere, they increasingly throw the system off balance. So, the total impact of a forcing on the climatic balance is a combination of that forcing’s weight, speed, and frequency of application. With that in mind, let’s examine the relative characteristics of some of the forcings on Earth’s climate. Changes in the Earth’s orbit around the Sun and shifts in continental tectonic plates can completely alter the global climate. However, these changes occur extremely slowly, over the course of tens of thousands or even millions of years. These are very large weights on the climate “scale”, but they are added very slowly. Much shorter term are changes in solar activity, cosmic rays, and wind and ocean patterns. It has been theorized that solar variances are coupled with changes in cosmic rays impacting the Earth. As solar activity declines, the amount of cosmic rays hitting the Earth increases, leading to an increase in cloud cover. This increased cloud cover drives temperatures down, amplifying the cooling from the decreased solar activity alone. Alternately, increased solar activity decreases cosmic rays hitting the Earth leading to decreased cloud cover and higher temperatures. While such changes can trend over time, they generally alternate, following the Sun’s roughly 11-year sunspot cycle. Cyclical changes in wind and ocean patterns can have a more noticeable impact, in the range of months to decades, and they can promote either warming or cooling conditions depending on their phase. For instance, El Nino conditions in the Pacific Ocean tend to promote warmer temperatures while La Nina conditions tend to promote cooling. Such forcings represent smaller weights that are alternately added to the scale and then removed from it in accordance with their natural cycles. Volcanic eruptions and impacts from celestial bodies are immediate and one-time forcings, but the magnitude of their influence is dictated by the size of the event. Outside of catastrophic instances, most of these events have either a minor or very short-lived influence. The weight from such an event might disturb the climate balance noticeably depending on the event’s size, but its impact is generally brief as the weight is quickly removed from the scale. The eruption of Mount Pinatubo in the Philippines in 1991 dropped global temperatures by one or two degrees Celsius, but this influence was only felt for about two years as the atmospheric aerosols produced by the eruption quickly dissipated. 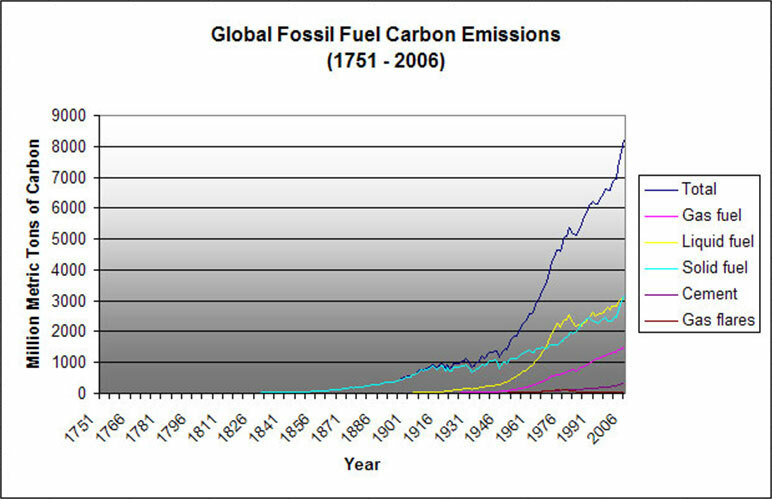 Figure 3-5: Carbon emissions from fossil fuel use have risen dramatically over the industrial period. Data source: CDIAC. Then there are changes in atmospheric greenhouse gases driven by human activities. While the impact of human emissions from any single year is minor, this influence differs from natural forcings in very critical ways. As displayed in Figure 3-5, emissions are increasing extremely rapidly and are not cyclical, so they continually place additional weight on the climate system with each successive year. As this weight from additional greenhouse gases is being added, the climate system reacts, attempting to restore the balance. Atmospheric and oceanic temperatures rise. Plant coverage expands. Ice coverage retreats. Oceanic acidity increases. Weather patterns change. But the weight from human activities is being added much faster than the Earth’s natural systems can react and compensate, so the system gets further and further off balance. The further off balance the system becomes, the more it needs to change to restore equilibrium and the more likely it becomes that those changes will be rapid and dramatic. So, let’s summarize this section. We know the Earth’s climate is continually impacted by numerous influences or forcings and that the Earth responds by changing characteristics of its biosphere to maintain a balance between forcings and effects. As on any level scale, this balance can be found with differing amounts of weight on each side, resulting in a very hot climate or a very cold one. We saw that the total impact of a forcing on the climatic balance must consider the forcing’s size, how fast or slow it is applied, and whether it is a single event, a natural cycle, or a persistent non-cyclical influence. As a result, a smaller forcing, applied quickly, can throw off the climatic balance more so than a large forcing applied slowly. Large volcanic eruptions are a good example. We recognized that nearly all natural forcings are either cyclical or one-time events whereas the influence of mankind is neither cyclical nor a one-time event. But how are these forcings currently impacting Earth’s climate? That will be the focus of our next section.